A professional musician, artist, teacher and writer, Mix is from London but currently based in Spain. She studied music from the age of 7, starting with piano, moving through violin, viola and oboe, before mastering the clarinet and saxophone. Mix trained classically following the ABRSM grade exams, and has played in many different ensembles, pop and jazz groups, orchestras and wind bands. She went on to study jazz and contemporary music at the City of Leeds College of Music in the UK, majoring in alto saxophone, clarinet and piano, and graduating with a First. 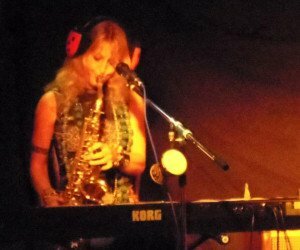 As a session musician based in London for many years, Mix played with numerous international artists; she has toured Europe, the USA and Japan playing sax and keyboards for major bands and musicians such as Groove Armada, Pee Wee Ellis and Fred Wesley (James Brown Horns), and Dina Carroll, and performed concerts with singers such as Jamie Cullum, Tony Hadley (Spandau Ballet), Michael Bolton, Gloria Gaynor and Boy George, in almost every musical style possible. She continues to perform live, playing gigs and touring with her jazz funk flamenco duo Spoondrift. Mix has taught in England, Spain, France and Switzerland, in performing arts schools, summer camps, adult night classes, primary and secondary schools as a peripatetic teacher, and private lessons for all ages and levels. She has taught the ABRSM and Trinity music syllabuses, and held songwritng workshops, as well as guiding many students through the writing/singing/recording process. With her passion for all aspects of music, Mix inspires her own love of playing in her students. Mix encourages creativity and believes that each student should be treated individually, have fun while learning, and every student should be left feeling good about themselves and their playing. Mix also speaks Spanish and French.